Researchers Norman Li and Satoshi Kanazawa report that highly intelligent people experience lower life satisfaction when they socialize with friends more frequently. The survey measured life satisfaction, intelligence, and health. 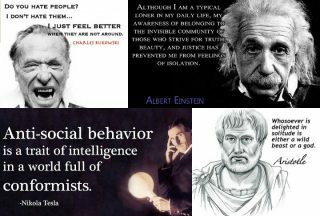 Analysis of this data revealed ……….that being around dense crowds of people typically leads to unhappiness, while socializing with friends typically leads to happiness — that is, unless the person in question is highly intelligent. That certainly doesn’t mean that if you enjoy being around your friends that you’re unintelligent. But it does mean that the really smart person you know who spends much of their time alone isn’t a sad loner — they probably just like it that way.